😂 well thanks! I've got some interesting ideas in the pipeline that hopefully everyone will enjoy. Haha, I'm only one man! Not sure I can have that much of an impact! I removed the option to pay for premium membership long ago as I decided to transition those features to the premium tier of membership but haven't got around to finishing that just yet. I have just changed your account to a premium account. So you should have access to those premium features as of right now. Any problems/questions just let me know. Well @474X14, that was quite a difficult bug to reproduce but I believe it is now fixed. Let me know if you have any further problems. The enemies list was used by only a handful of users and they mostly just put themselves in there so I didn't want to keep it around as it meant more work on a mostly unimportant part of the site every time I make broadly sweeping changes to the framework powering the core of the site when my time could be better spent on features most users interact with. Regarding the popularity of the site I can only really blame myself, I couldn't work on the features users were requesting fast enough due to other commitments like work and family/friends and some poor architecture decisions I made early on that I've been trying to rectify for a long while. Believe it or not although the look and feel of the site hasn't changed in a long while the entire backend of the site has been overhauled since the start of this year to try and bring it inline with modern software development practices and to aid me in adding new features going forward. 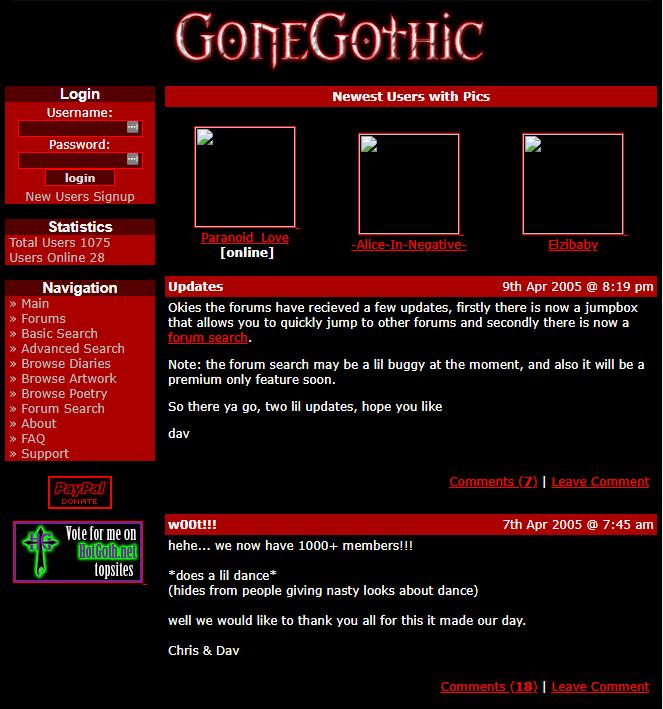 I'm not suggesting the site will ever return to its former glory, but it still has a special place in my heart and maybe one day I might be able to pull something out of the ashes that people find interesting. Sorry about this. This is probably a regression as I've implemented a change recently to use a stronger hashing algorithm for passwords. I'm currently on holiday at the minute but will take a look once I'm home on Friday. You know you can still make it red by using the Site Info > Switch Site Style right?